“What happened today (yesterday) in the law-court was just not a travesty but a slap on the face of those that believe in fairness, equity, and justice but in the zoo called Nigeria, Binta Nyako and her likes have reduced law to a laughable situation. What they have done is to drag themselves down with their Sharia mindset into the gutter and we’re here to help them accomplish that since they want to disgrace themselves. “We have done nothing wrong, we have broken no laws. There’s no Cade before the court of Binta Nyako but she proceeded to conduct this sham trial in the hope of endearing herself to the Fulani caliphate, in the hope of perpetuating the rule of the uncivilized over the children of light and that cannot happen because justice is on our side. “We’re going to teach her a very bitter lesson. We’ll tell her that we’re Biafrans and we can never be intimidated, not by her or by anybody. This very judge today, by the virtue of her ruling has forfeited every right to continue to preside over my case. “In November of last year, we presented applications after applications before this very judge and in every occasion, she set it aside and said she won’t listen to it. When confronted by our lawyers, her only defence was to say that ‘this is my courtroom, I can do whatever I like’ and they claim that Nigeria is practicing democracy. “If Justice Binta Nyako feels that she’s under any form of pressure from the cabal which we know about, the only thing judicious for her to do in this very case is to refuse herself. She must remove herself from this very case because she has lost every moral authority to continue to preside on it. “What do you expect from a country where a Sharia judge is the Chief Justice of the Federation? Anybody with any shred of common sense will tell you that it is a legal contradiction to revoke bail after deferring the issue of forfeiture of bail bonds by the sureties. It is a travesty of justice, something that has never happened before. Meanwhile, lawyer to the IPOB leader, Mr. Ifeanyi Ejiofor while reacting to the controversial ruling of the Federal High Court, revoking the bail of his client and issuing a bench warrant against him, assured that the order will not stand as it would be going for an appeal to challenge the ruling of the lower court. Speaking to our reporters, shortly after the court proceedings the IPOB’s senior counsel stated that the defence team would immediately file a motion to vacate the “obnoxious order by the presiding judge,” citing the fact that the judge should have taken into consideration that his client, Nnamdi Kanu, did not willingly jump bail but was forced to leave the country after a failed assassination on him by the Nigerian military. He added that the court has failed to give the defence an ample opportunity to establish its case on the circumstances leading to the disappearance and inability of the IPOB leader to stand for trial. “The law is very trite and we’re concerned about the relevant case pursuant to the law which they rely upon which was Section 352(4) of the ACJA. The law also allows us ample time to explain to the court why my client is not here, which is also very sacrosanct. “Secondly, the matter wasn’t coming up for a substantive suit, it was coming up for the hearing of the sureties’ application which was also noted by the prosecution when he was asked by the court the business of the day. He told the court that we are here for pending applications filed by the sureties. “The sureties have gone on appeal based on the ruling delivered by the court at the last adjourned date and proceedings in that respect has been stayed(suspended). So it was expected that in that circumstance for a new date to be given to us for an outstanding trial. “Then on that day, we’ll now furnish the court with particulars of the absence of my client; why he is not here today. That’s what we expected in the circumstance and also tender a shred of verifiable evidence because it is not something we can address the court orally. We have documents to prove in court why he is not here. 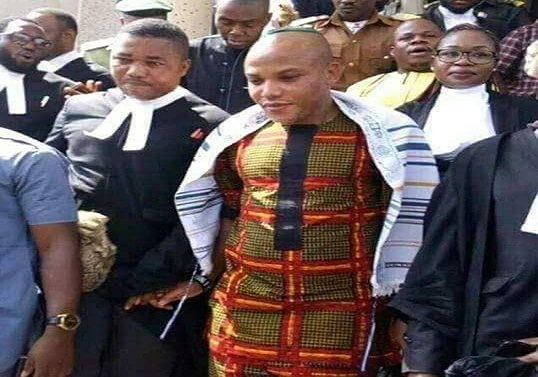 “Today(Thursday), we expected that having stayed the proceedings of the suretyship, the court would afford us ample time to address it on why he(Kanu) is not here. “However, we intend to challenge this ruling on appeal. Of course, the court noted that I’m going for an appeal to challenge the ruling because not that he(judge) doesn’t have the power to revoke his bail or order for his arrest but the fact that we have to be given time for a fair hearing in line with the constitution.